On Sunday October 23 saw Chelsea brutally defeat Manchester United with 4 goals to none at Standford Bridge. The lost meant that Chelsea because 5 points clear from Manchester United which makes them to move to 4th position 9 game of all teams in EPL, while United remains in 7th position. 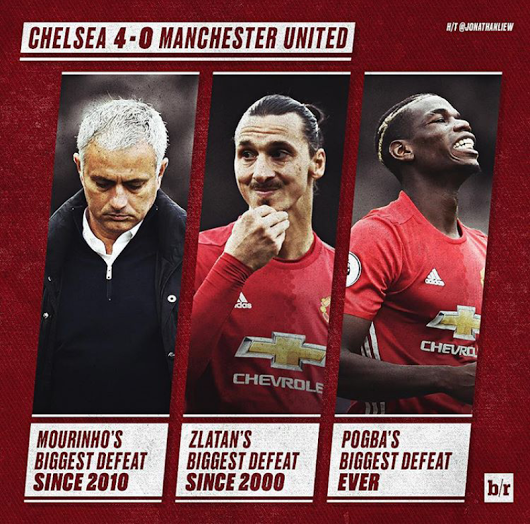 But Manchester United remaining in the 7th position in the League table was not the only thing that made their defeat in the hands of Chelsea heartbreaking, the record of some players Manchester United and the club's manager himself was also affect. Paul Pogba's biggest defeat EVER!!! What do you think about this stats?